Sleep disorders in older adults involve any disrupted sleep pattern. This can include problems falling or staying asleep, too much sleep, or abnormal behaviors with sleep. Sleep problems are common in older adults. The amount of sleep needed stays constant throughout the adult years. Doctors recommend that adults get 7 to 8 hours of sleep each night. 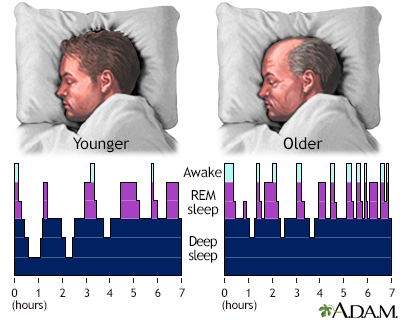 In older adults, sleep is less deep and choppier than sleep in younger people. A healthy 70-year-old may wake up several times during the night without it being due to disease. The health care provider will take a history and perform a physical exam to look for medical causes and determine which type of sleep disorder is causing the problem. Relieving chronic pain and controlling medical conditions such as frequent urination may improve sleep in some people. Treating depression can also improve sleep. Avoid stimulants such as caffeine after mid-afternoon. Get regular exercise early in the day. Avoid using sleeping pills to help you sleep, if possible. They can lead to dependence and can make sleep problems worse over time if you don't use them the right way. Your provider should assess your risks of daytime sleepiness, mental (cognitive) side effects, and falls before you begin taking sleep medicines. If you think you need sleeping pills, talk with your provider about which pills are safe for you when taken properly. Certain sleeping pills should not be taken on a long-term basis. DO NOT drink alcohol at any time when you are using sleeping pills. Alcohol can make the side effects of all sleeping pills worse. WARNING: The FDA has asked manufacturers of certain sleep medicines to put stronger warning labels on their products so that consumers are more aware of the potential risks. Possible risks while taking such medicines include severe allergic reactions and dangerous sleep-related behaviors, including sleep-driving. Ask your provider about these risks. For most people, sleep improves with treatment. However, others may continue to have sleep disruptions. Call for an appointment with your provider if a lack of sleep or too much sleep is interfering with daily living. Getting regular exercise and avoiding as many causes of sleep disruption as possible and adequate exposure to natural light may help control sleep problems. Bliwise DL, Scullin MK. Normal aging. In: Kryger M, Roth T, Dement WC, eds. Principles and Practice of Sleep Medicine. 6th ed. Philadelphia, PA: Elsevier; 2017:chap 3. National Institute on Aging website. A good night's sleep. 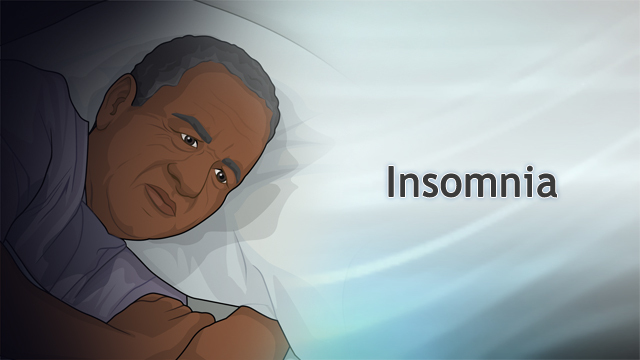 www.nia.nih.gov/health/good-nights-sleep#insomnia. Updated May 1, 2016. Accessed September 5, 2018. Shochat T, Ancoli-Israel S. Insomnia in older adults. In: Kryger M, Roth T, Dement WC, eds. Principles and Practice of Sleep Medicine. 6th ed. Philadelphia, PA: Elsevier; 2017:chap 153.